I got my makergear m3 ID rev 1 yesterday. I went through the setup and everything looked fine. I imported the S3D profiles for the printer as well. Attached below is my first benchy. The detail work on the bottom and other areas is flawless, but there are issues as you can see. Is my temp too low? Something else entirely? You normally print benchy's without support, correct? Any tips would be great. Thanks! Re: First benchy -- tips? Oh goodness. This is very different from the results I have gotten from M3-ID Rev 1 (though I haven't done a Benchy on this machine yet). You do typically print Benchy without supports. I'm assuming if you run some of the example prints that are already sliced and already in OctoPrint (like the MakerGear keychain), those are coming out looking good? I've only done one of the pre-sliced example prints which was the keychain and it came out fine, but that's not very technical. 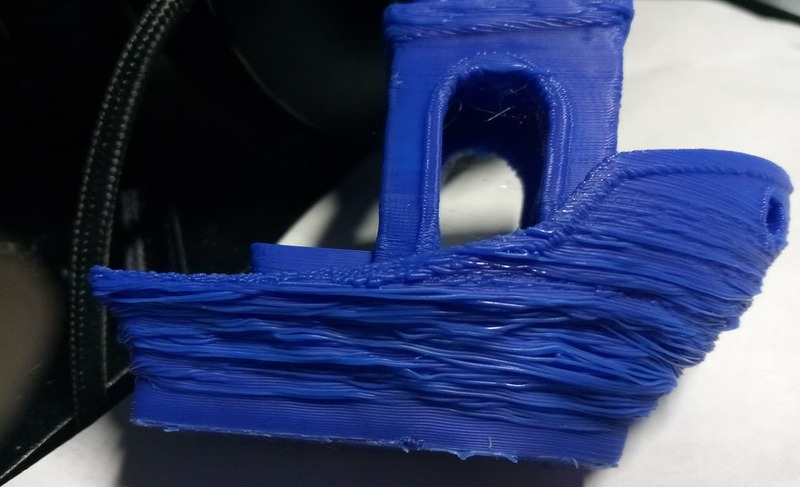 I'd like to be able to import the settings from one of those pre-sliced ones and try the benchy with that, but I'm not quite sure how to import settings in S3D from a gcode file. I know you can do that in Cura so I'm guessing you can in S3D as well. I'm not sure what the auto configure settings in S3D are. I'm totally new to S3D -- I've been using Cura up until now. When I got my machine I went to the Makergear Zendesk site and downloaded the S3D profiles and used those. Is there something else in S3D I need to do? As for speed, it was at the normal or default -- not "Nice" or "Fast". I *BELIEVE* the temperature was actulally pretty low -- 190 or 200 -- but I could be wrong. I'll double check when I get home. I'm not sweating it either way. I'm pretty confident this thing will print like a dream once I get it dialed in a bit more. I've only been 3d printing for like 10 days now. I started with a maker select plus/duplicator I3 Plus and did every available upgrade which required me to take the machine apart down to the bolts pretty much. I'm learning fast, but there's always room to improve.